HOUSTON, TX--(Marketwired - Mar 18, 2014) - Entering into its 25th year, the 2014 Hurricane Symposium, presented by ImpactWeather, a StormGeo company, will feature the nation's leading meteorologists, business continuity executives and safety specialists, on Thursday, May 15, 2014, at the Stafford Centre in Stafford, Texas. With hundreds of business professionals in the audience, speakers will present the latest hurricane forecasting technologies, real world case studies, advice on emergency response planning and more, to prepare organizations for the upcoming hurricane season. "Companies that overlook severe weather preparation are more likely to fail or never reopen following a major weather event," said ImpactWeather President Mark Chambers. "It only takes one storm to shut down a rig, demolish a store or ruin a neighborhood. 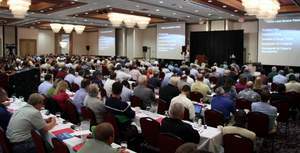 Our symposium is designed to take the guess work out of hurricane response planning." This year's speakers will address hurricane forecasting from a meteorologist's perspective, introduce strategic ideas on how to implement hurricane planning and include networking opportunities. KPRC Local 2's Chief Meteorologist Frank Billingsley will emcee the symposium, which will host former National Hurricane Center Director Bill Read, Port of Houston Managing Director of Port Security and Emergency Operations Captain Marcus Woodring, and Hospital Corporation of America (HCA) Executive Director of Emergency Services Allen Johnson. "Unlike other hurricane conferences which address the general public's concerns, our symposium caters specifically to corporations with assets, operations or personnel affected by these dangerous and damaging storms," added Chambers. "The faster a corporation returns to normal operations, the quicker a community can bounce back. We want to help companies learn how they can achieve this goal." For more information about the event, visit www.HurricaneSymposium.com. ImpactWeather's annual Hurricane Symposium is designed for the business professional, emergency operations manager, HSE specialist, business continuity coordinator and those who want to stay one step ahead of the competition during hurricane season. This business continuity-focused event is an entertaining and educational discussion about hurricane preparedness best practices, strategies and case studies. For more information, visit www.HurricaneSymposium.com. ImpactWeather's 25th Annual Hurricane Symposium on May 15, 2014, will feature the latest hurricane forecasting technologies and business continuity strategies to prepare businesses for the upcoming hurricane season.